Fish vs fish: How AlerTox can help detect fish allergen in your facility. : How AlerTox can help detect fish allergen in your facility. Fish are included in the FALCPA list of food allergens that cause the majority of IgE-mediated food reactions and need to be carefully labeled on food packaging. But fish is listed as a category with no differentiation between any of the myriad of species, even between bony and cartilaginous. So, why and when does fish protein impact fish-adverse patients – and what can food manufacturers do to protect customers with fish allergies? Unfortunately, allergy to fish proteins is on the rise. Estimates vary, but both fish and crustacean allergies more commonly affect teenagers and adults rather than children. About 40% of people with fish allergy experience their first reaction as an adult, and unlike other food allergies, it worsens with each exposure. As with any allergy, avoidance strategies are the first line of defense for any patient unlucky enough to have a reaction. Fish are usually divided into two evolutionary lineages of isoforms: the α-parvalbumins, which are generally classified as non-allergenic, and the β-parvalbumins, where the majority of IgE-reactive parvalbumins are included. Bony fish, like cod, fall under the latter category while sharks (cartilaginous fish) would be under the former. Although more rare, allergic reactions to cartilaginous fish (α-parvalbumins) does exist. There isn’t a great deal of similarity between the α- and β-parvalbumins, with the result that there is a reduced cross-reactivity between bony and cartilaginous fish. 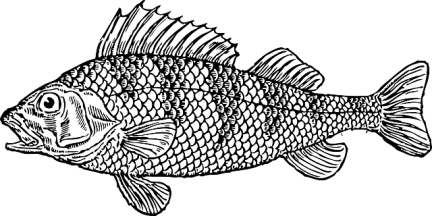 However, cross reaction is especially prevalent with bony fish allergies; over half of individuals who are allergic to one bony fish will be allergic to another. Parvalbumins, a protein common in most bony fish, are currently reported as responsible for more than 95% of allergen reactions induced by fish, including the cartilaginous varieties. Interestingly, frog muscle also contains the protein parvalbumin and can cause a reaction in vulnerable individuals. However, there is no cross reactivity between crustacean and bony or cartilaginous fish. Although not complete, the list of fish with β-parvalbumins includes cod, mackerel, herring, sardine. anchovy. bass, haddock, hake, plaice, sole, salmon, tuna, trout, Alaska pollock, catfish. perch, and carp. Cod, an example of a bony fish. Cod, carp and Atlantic Salmon are what makes it onto the plate most frequently in North America and Europe. With that in mind, these species are perhaps the most studied. Less is known about fish allergens in the Australasian region for instance, even though fish is a regular dish. It is impossible to manufacture a single kit that can recognize all species of fish, but it is possible to catch the majority of trace allergens from bony fish because the reaction involves the β-parvalbumins protein. Since most patients that have an allergic reaction to fish are allergic to Cod, the major allergen designated as Gad c 1, which is isolated from Baltic cod (Gadus callarias), is often used as a reference molecule for the study of parvalbumins. The reference matrix used in the AlerTox Sticks Fish kit is cod, and the test has been validated against between 30-50 types of bony fish. The sensitivity of AlerTox Sticks Fish is ca. 5 ng/ml of target protein of cod (Gadus). In other fish species it may be described only approximately due to variability of the antigen content and level of homology to cod. Although AlerTox Sticks Fish can recognize between 30-50 types of bony fish, some show a reduced response in certain manufacturing processes. Canned tuna and surimi, or crab stick, are particularly difficult to detect. Heating the fish reduces the sensitivity of the test. If the fish is prepared on site, with a normal preparation process, the AlerTox Fish kit should be able to detect the presence of the fish protein, although the sensitivity is not as great as it is for raw fish. However, canned fish is prepared at a much higher temperature, and the test may not be able to recognize the protein on which it is trained. 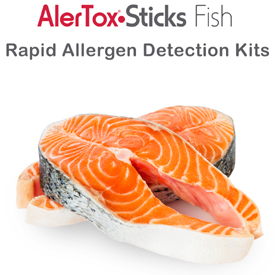 AlerTox Sticks kits are designed to detect traces of allergen, and therefore samples that are very high in allergenic proteins (eg more than 5,000-10,000 ppm) may incur a false negative in the form of a hook effect. Matrices that contain a very high amount of the allergen can override the test. If you suspect this to be the case, an option is to dilute the sample (1 part sample to 3 parts water, for example) and re-test. Lateral flow kits like AlerTox Sticks can have trouble with foods that have been fermented, hydrolyzed, malted, cured or otherwise very highly processed to the point where their proteins start to break down. The antibody in the test kit is looking for a very small sequence of amino acids, and it needs to have this sequence repeated at least 2x/molecule to catch and count the molecule in its search for the PPM value. 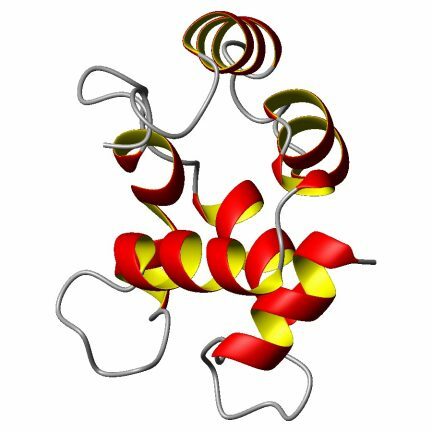 As food processing breaks the proteins apart, there is a phase where they could be too small to get “caught” by the test but still big enough to cause damage to someone with an allergy. • Non reactive to mammal and avian meats and innards (<0.001%). • Trace cross-reactive to crustacean tissues (<0.025%). • Weak cross-reaction to lamprey, crab, lobster, scallops or shrimp (<0.1%). • Cross reaction to Amphibian tissues (frog meat, up to 3%). AlerTox Sticks Fish does NOT detect the antigens of other crustaceans such as: shrimp, lobster, crab and shellfish (mollusks) and lamprey. Allergenicity of bony and cartilaginous fish – molecular and immunological properties. Antibody reactivity to the major fish allergen parvalbumin is determined by isoforms and impact of thermal processing.